Back in 2010, NAD turned the high-end audio world on its ear with their revolutionary M2 DirectDigital™ integrated amplifier. It combined the strengths of a Class D amplifier section — high efficiency and high power — with pristine sound that could compete with cost-no-object designs. Think of NAD's M32 as a "son of M2," offering a bit less brute power, but a lot more versatility and future-readiness. This flexible multi-tool of a component gives digital audio sources top priority, and the list of inputs includes optical, coaxial, balanced AES/EBU, and asynchronous USB. You also get three analog inputs, including an excellent phono input for connecting your turntable. The power amp section is conservatively rated at 180 watts per channel into 8 or 4 ohms, which means the M32 will drive virtually any pair of speakers. And a discrete headphone amp will make your headphones sing. The M32's digital and analog inputs can handle your best audio sources, including high-res digital downloads and vinyl. NAD's DirectDigital amplification combines all pre-amplification and power amplification functions into a single amplifying stage. That makes the path between source and speaker much shorter and simpler. Because the M32 handles digital audio signals directly, you won't hear the noise and distortion that's added by the analog amplifying stages found in conventional amplifiers and preamps. Without all that noise to compete with, the subtle details you never noticed will emerge, even from tracks you've heard a hundred times. You'll get a clearer sense of the dimensions of the performance space, and be able to better appreciate the rich tonal texture of each instrument. Lots of people assume that all Class D amps are digital amps — that the "D" stands for digital — but that's not the case. Most Class D amps are actually analog, but the M32 is truly digital, not just Class D. Another unusual feature of the M32 is the way it uses feedback to minimize distortion in the output stage. Here's how it works: The output signal is continuously compared to the input signal, and a mirror image of the difference (distortion) is introduced in order to cancel it out. This all happens while the signal is still in the digital domain, before it's converted to analog at the speaker outputs. The M32's back panel features four MDC (Modular Design Construction) slots. One has a digital audio input board pre-installed, while the remaining three are available for customization and expandability. One compelling option is NAD's BluOS™ module, which is a cool way to explore the BluOS multi-room audio ecosystem. BluOS is an advanced music management system with support for local NAS drives and streaming audio services like Spotify®, Tidal®, and many others. Once you install the optional BluOS module, you can centralize your digital music libraries and streaming services. The free app lets you easily control playback with any smartphone or tablet. Truly amazing. Replaced a Denon receiver that I thought sounded good until I got the M32. It sounds like I got an new set of speakers. Every aspect of my music sounds better. 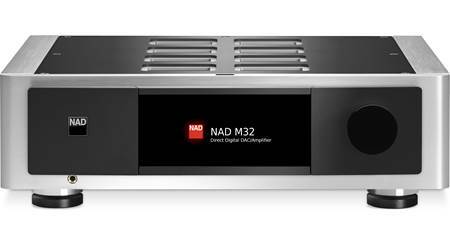 Direct Digital Amplification: The NAD Master Series M32 employs an innovative DirectDigital Feedback Amplifier built under license from Cambridge Silicon Radio (CSR). This is a true digital amp (not just Class D) that is computer controlled and amplifies entirely in the digital domain, converting to analog at the speaker terminals. DirectDigital amplification combines all pre-amplification and power amplification functions into a single amplifying stage with incredible fast and accurate digital correction. Advanced software-controlled algorithms result in the shortest signal path from source to speaker to produce virtually no distortion and a high damping factor. This technology is among the fastest and most accurate amplification and error correction available. Sophisticated Software: DirectDigital amplification combines all preamp and power amp functions of the Master Series M32 into a single amplifying stage controlled by software. Highly advanced mathematics determines all control functions including volume and filters. This produces a dramatic reduction in noise and distortion, and brings you much closer to both the music and the performers. Traditional volume controls that change the gain in an active analog circuit cannot approach the transparency of the M32. It also allows accurate tone controls that only change tone, without adding phase shift or distortion. Rugged Construction: The NAD Master Series M32 integrated amplifier's all-alloy casework is elegant and rugged. Rigid panels with magnetic iso-point feet provide a solid foundation for the multi-layer circuit boards and intricate internal construction. Asynchronous USB-B Port: The NAD M32 direct digital DAC is ready for the world of computer audio with its rear-panel asynchronous USB (type-B) input that can directly stream 24-bit/192kHz content from your Windows PC, Mac computer, or other network-attached storage device (NAS). Your computer will need to meet the following system requirements. Digital Inputs: The NAD M32 includes five digital audio inputs; two optical (Toslink), two coaxial (RCA), and one AES/EBU (balanced XLR). 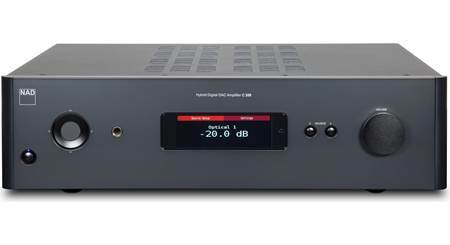 Digital AES/EBU (XLR) Input: The NAD M32 is fitted with a Digital AES/EBU (XLR) jack to connect high-end audio sources, such as SACD and DVD-Audio players. For high-end sources with higher sampling rates like 176kHz and 192kHz, it is highly recommended that such sources be interfaced with the AES/EBU (XLR) In connector. Digital Coaxial/Optical Inputs: The M32 also features two rear-panel optical (toslink) digital outputs and two coaxial (RCA) digital outputs to connect your digital audio components. Connect your CD, DVD, and Blu-ray disc players. The Digital inputs support sampling rates of 32-192khz. Analog Inputs (including Phono): The NAD M32 is outfitted with two analog stereo RCA line inputs and a MM Phono input. An accurate RIAA equalization, a clever phase cancelling infrasonic filter, and a huge overload margin combine to bring out the best in your vinyl collection. 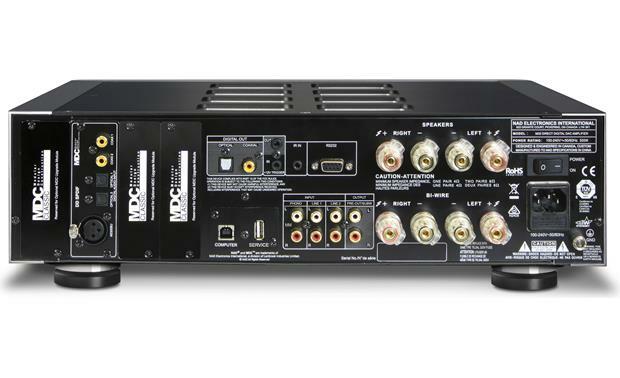 Digital Output: The optical (toslink) output & coaxial (RCA) digital output can be used to connect the M32 integrated amplifier to a corresponding digital audio input of an AV receiver, computer, or other digital processor. Pre-Out: The integrated amplifier's stereo analog RCA output can be used as a full-range pre-out, making it possible for the M32 to be used as a full-range preamplifier to an external power amplifier. The stereo analog RCA output can also be used as a low frequency output to connect one or two powered subwoofers, so only low frequency information is sent to the connected powered subs. When used as a sub output, you have access to a variable low-pass crossover (40-200Hz) and trim level (-12 to 0dB). Two Sets of Speaker Terminals For Bi-Wiring: The M32 has two sets of speaker terminals which are identical in function and are wired in parallel. They allow for bi-wiring a single pair of speakers. Each speaker terminal consists of a binding post that will accept up to 10AWG wire, pin-connectors, and banana plugs (single only). Discrete Headphone Amplifier: The NAD Master Series M32 is equipped with a fully discrete headphone amplifier which is able to drive even planar and high impedance studio monitor headphones. With high voltage and low output impedance, your headphones will sound their best. Volume, tone, and balance controls are available during headphone listening. When a set of headphones is plugged into the front-panel 1/4" headphone jack, the integrated amplifier's speaker outputs will be muted. 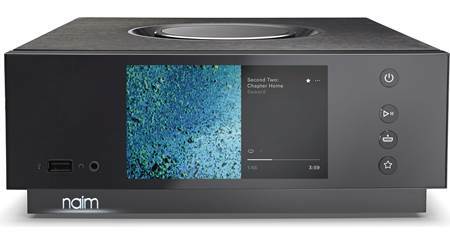 Front-Panel Knob & Touchscreen: The integrated amp's single control knob for volume is supplemented by a TFT touchscreen display, which replaces a multitude of mechanical switches and expands the range of adjustments possible with detailed graphical readouts. 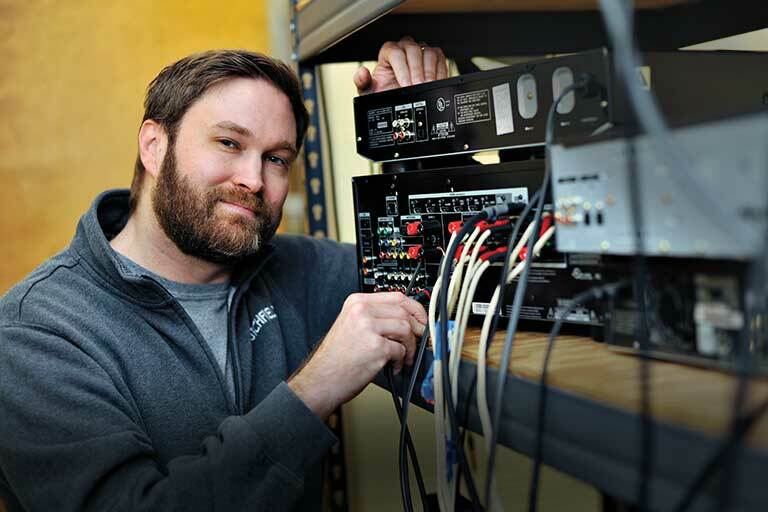 Because the controls are all software defined, NAD can add new controls and features by simply upgrading to new firmware. EQ: The M32 integrated amplifier offers Bass, Treble, and Balance control. Bass and Treble only affect the low (60Hz) and high (20kHz) frequencies, leaving the critical midrange frequencies free of coloration; adjustable from -10 to + 10dB. The Balance control adjusts the relative levels of the left and right speakers. IR Remote: An IR remote is also included for wireless operation of the NAD M32 integrated amplifier and NAD source devices. Remote Integration: The NAD M32 offers 12V triggers (in/out), IR In and RS-232 port connectivity for remote integration. IR In: This 3.5mm input is connected to the output of an IR (infrared) repeater (Xantech or similar) or the IR output of another component to allow control of the M32 from a remote location. 12V Triggers: The 12V Trigger Input (3.5mm) allows the M32 to be switched On remotely from Standby Mode by compatible devices such as amplifiers, preamplifiers, receivers, etc. If the 12V DC supply is cut off, the M32 will return to standby mode. The 12V Trigger Out (3.5mm) is used for controlling external equipment equipped with a +12V Trigger Input. 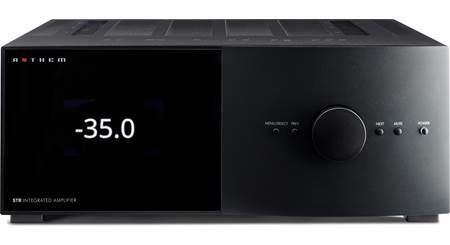 Auto Standby: The integrated amplifier can be set go automatically go into standby mode after approximately 15 minutes of no audio signal and inactivity. 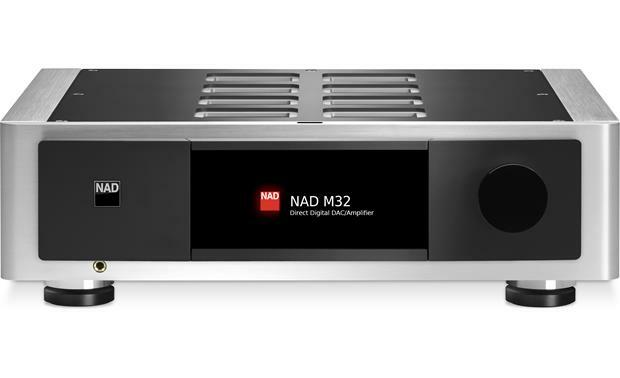 Searches related to the NAD M32 Masters Series Stereo integrated amplifier with built-in DAC.